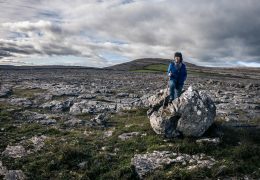 Set on a 50 acre organic farm of wildflower meadows, fairy woodlands, limestone and a disappearing lake, Burren Nature Sanctuary is an ideal introduction to the magical Burren landscape. Situated in the picturesque village of Kinvara along the Wild Atlantic Way Burren Nature Sanctuary is a hidden gem as you travel from Galway or Dublin to the Cliffs of Moher. Visit the Botany Bubble home to the National Collection of Burren flora in season which showcases the unique and diverse Burren geology and flora where Alpine, Mediterranean, Arctic and tropical plants grow alongside native Irish wildflowers. Explore the mile-long looped nature trail dotted with interpretive panels as it meanders through Burren habitats of karst limestone, ancient hazel and ash woodland. The orchid rich wildflower meadow grazed by Galloway cows and miniature ponies is home to majority of Ireland’s butterflies. The audio walking guide really brings the landscape to life. 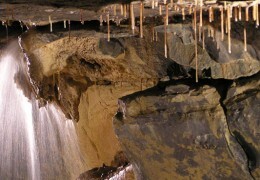 Discover fossils from ancient tropical seas in the limestone rocks formed over millions of years. Identify seasonal wild flowers growing in the spaces between the rocks. Stroll along the boreen, a grassy track lined with native Irish trees all the way to the turlough and unusual freshwater lake that disappears into limestone caves in time with the tides. 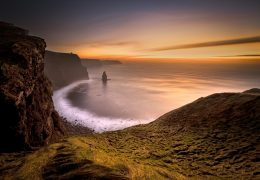 Connect with nature, yourself and each other in the peace and tranquillity of this ancient landscape. Relax in the Sanctuary Café, enjoy freshly baked scones, tasty lunches and great coffee, our children’s menu offers no fizz, no fry and hidden vegetables. Browse the Avoca gift shop, local crafts.